With boxing fans crying out for competitive fights; VIP Promotions have lined up what promises to be a terrific headliner at the Liverpool Olympia on November 30. 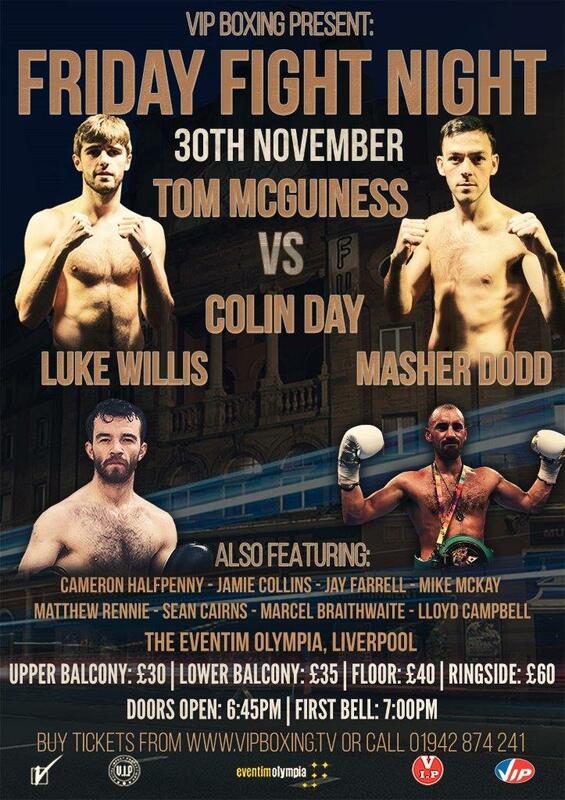 It’s unusual for prospects to be pitched against each other early intheir careers, but Liverpool’s Tom McGuinness and Skelmersdale’s Colin Day will top the bill at the renowned fight venue, and promoter Steve Wood is predicting a war. McGuinness is unbeaten in seven pro starts, with two early finishes and,at 23, is the younger man heading into the contest. A former Senior ABA quarter-finalist and England international, Tom had 54 fights as an amateur, losing just 11. Day’s ledger is almost perfect, with just a single loss from six bouts. The sole blemish on the28-year-old’s record came last year when he lost by a single point to experienced County Durham fighter, Jordan Ellison. With 20 wins from 30 contests, ‘Boom Boom’ also had a decent amateur career that saw him trialling for the GB squad. “He’s a good fighter. I believe he’ll have a stand off-ish approach, and I’ll probably be the more aggressive fighter,” countered Day. “I can box, but because of the size difference, everyone expects me to come and fight becausehe’s the taller man, but I can box too. I can probably win on points, if I stick to the plan.